You don’t have to, but thanks to your private kitchen you totally can! You’ll have more than enough room for a mid-vacation game of Twister. You’re just a short walk from all of the fun. This resort is right on gorgeous Myrtle Beach. This resort provides a peaceful retreat from all of the excitement of Myrtle Beach. Visit the Family Kingdom Amusement Park or Splashers Waterpark, both a short walk from the resort. 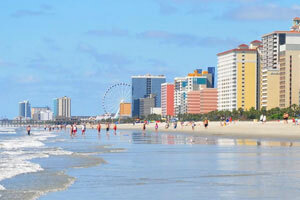 Bali Bay Resort is located in the heart of Myrtle Beach. Drop off your luggage in your condo, get changed into swimsuits, apply sunscreen and get ready to hit the outdoor pool. Lounge poolside with a drink and the latest issue of People magazine. Since everyone is already dressed for the water, take advantage of the proximity to Splashes Waterpark. It’s adjacent to the resort – how convenient is that? With kiddie pools, speed slides, water flumes and a 425-foot-long lazy river there’s no chance of the kids complaining of boredom. Get your acceptance speech ready – you’ve just won Best Vacation Planner Ever. But wait, there’s more! Bali Bay Resort is only a short walk from Family Kingdom Amusement Park. Attractions range from go-karts and roller coasters to rides for the little ones and activities you can enjoy as a family. Two- and three-bedroom condos sleep up to six guests and are spacious enough for the kids along with their stuffed animals, blankets and even a few imaginary friends. All residences are individually furnished and decorated and feature full kitchens. Head to Food Lion to stock up on the essentials (and maybe a few non-essentials; you’re on vacation!). Feel like getting in touch with your inner-Betty Crocker? You won’t have any trouble persuading the kids to help bake chocolate-chip cookies. Don’t worry if the eggs or flour decide to go rogue, that’s what the in-suite washer/dryer is for. The resort is a short drive to two of Myrtle Beach’s best attractions: Broadway at the Beach and the Myrtle Beach Boardwalk. Broadway at the Beach has a variety of shops and restaurants. Make your own unique pair of flip flops at the Flip Flop Factory. Pick up a new pair of stylish shades at Sunglass Hut. Create a special piece of jewelry at Pick a Pearl. Hungry? Señor Frog’s, King Kong Sushi and Johnny Rockets are just a few of your choices. Going for a ride on the Myrtle Beach Boardwalk’s SkyWheel is an adventure you won’t want to miss. It’s almost 200 feet tall and allows you to experience a bird's eye view of Myrtle Beach. If you aren’t quite ready to head back to the resort after your ride, let the kids explore the interactive exhibits at the Children’s Museum of South Carolina. They will have so much fun they won’t even realize that they are learning. It’s a win-win! - There is no front desk at this property. The check-in location differs from the property location. Check-in for this property is based at a different location, Atlantica Resort - 1700 North Ocean Blvd. Myrtle Beach, SC 29577. The front desk at Atlantica Resort is open 24 hours.